A parking permit is required to park in any parking lot on campus. Visitor parking is designated by sign in some parking lots but is extremely limited. 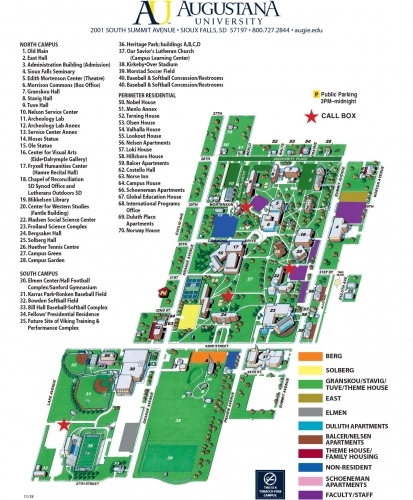 Non-permited parking is allowed during events on campus in all academic parking lots and the Elmen Center parking lot. Vehicles blocking roadways and sidewalks, parked in the wrong lot, or otherwise improperly parked will be ticketed and may be subject to towing. All campus parking has signage indicating which area it is designated for. Overnight parking is not allowed in non-residence hall lots (commuter, staff/faculty, visitors). The non-residence academic "blue" parking lots are open after 3 p.m. Monday-Friday and on weekends if no events conflict. Visitor parking stalls are reserved exclusively for this purpose. Current registered students, under any circumstances, are never considered visitors. Handicapped parking stalls are restricted by state law for use by handicapped persons only (these spaces are subject to City enforcement). All areas posted as fire lanes, service vehicles, or reserved are restricted as posted. Fire lanes and handicapped parking spaces are subject to University and City enforcement; no exceptions are allowed. Vehicles parked in fire lanes are subject to immediate tow. Due to the need for snow removal and maintenance parking in the "Blue" parking lots, all driveways, service entrances, and circle drives are designated for No Overnight Parking — (1- 7 a.m.) all days of the year.